Its unique ingredients helps you lose weight with no risks, no side effects, makes you feel more energized and full of life. Atulya NutritionTM Fateze is a unique blend of Garcinia cambogia, Camiphora Mukul, Wheat grass, Pineapple extract, amla and other appetite suppressant herbs that work together synergistically to be an extremely efficient weight loss natural and safe supplement. Fateze is high in dietary fibre, lowers the glycemic index and used in conjunction with a sensible diet and exercise helps maintain normal blood sugar and cholesterol levels. Commiphora mukul, Garcinia cambogia, Triticum aestivum, Ananas comosus, Phyllanthus niruri , Trigonella foenum, Terminalia arjuna, Gymnema sylvestre, Embelia ribes, Convolvulus pluricaulis, Tinospora cordifolia, Pterocarpus marsupium, Phyllanthus emblica, Berberis aristata,Terminalia chebula, Piper longum, Piper nirgum, Curcuma longa. Its unique ingredients helps you lose weight with no risks, no side effects, makes you feel more energized and full of life. 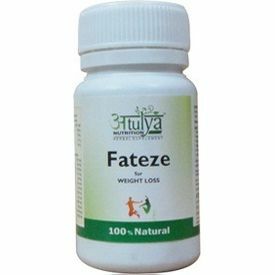 Atulya NutritionTM Fateze is a unique blend of Garcinia cambogia, Camiphora Mukul, Wheat grass, Pineapple extract, amla and other appetite suppressant herbs that work together synergistically to be an extremely efficient weight loss natural and safe supplement. Fateze is high in dietary fibre, lowers the glycemic index and used in conjunction with a sensible diet and exercise helps maintain normal blood sugar and cholesterol levels. Addresses imbalances of · Accumulating toxins · Stress · Poor nutrition · Poor digestion · Strengthens the immune system. Ingredients Commiphora mukul, Garcinia cambogia, Triticum aestivum, Ananas comosus, Phyllanthus niruri , Trigonella foenum, Terminalia arjuna, Gymnema sylvestre, Embelia ribes, Convolvulus pluricaulis, Tinospora cordifolia, Pterocarpus marsupium, Phyllanthus emblica, Berberis aristata,Terminalia chebula, Piper longum, Piper nirgum, Curcuma longa.